Radiohead, Beyonce, & Kendrick Lamar Headline Coachella 2017! 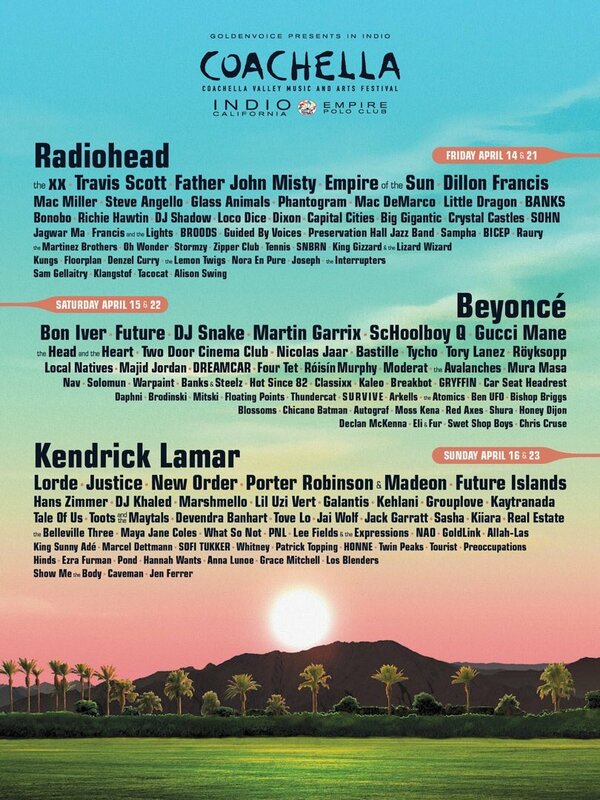 Whoever made the lineup for Coachella deserves a raise, that is for sure. This lineup is absolutely insane. Of course the three main headlining acts are Beyonce, Kendrick Lamar, and Radiohead but there are a ton of other acts that are performing that I would love to see. Then again I am not a rich hipster so I will probably never be at Coachella. One name that really pops out at me is seeing Lorde. Does this mean we are finally getting new music? It has been far too long since we have heard anything from her debut album. A lot of people hate her voice but her talent is undeniable. Other than that you have Bon Iver, Mac Miller, Grouplove, Travis Scott, and many more incredible acts! My favorite though? Hans Zimmer. If you think you don’t know him you do, don’t worry. He is an award winning movie composer. He had composed scores for ‘The Lion King’, ‘Pirates of the Caribbean’, ‘Gladiator’, and much more. That will be the trending performance on social media, I am sure of that. Posted on January 4, 2017 January 4, 2017 Categories Celebrities A-J, Celebrities K-ZTags 2017, Beyonce, Bon Iver, Coachella, Grouplove, Hans Zimmer, Kendrick Lamar, lineup, Lorde, Mac Miller, RadioheadLeave a comment on Radiohead, Beyonce, & Kendrick Lamar Headline Coachella 2017! Well that is quite the line up, right? Between this lineup and the IHeart Radio Festival I will be crying that I can’t go to either! So you thought right? You can actually win your win way in through social media, which is pretty incredible. By sending out different tweets, Instagram posts, there are different ways to earn points and be eligible to go to the concert. Obviously the performers are incredible. Rihanna, Usher, Selena Gomez, Metallica, Kendrick Lamar, Ellie Goulding and more? All for free? Well all for kind of free. You just need to start getting active with your activism on social media. The hosts are pretty incredible too. 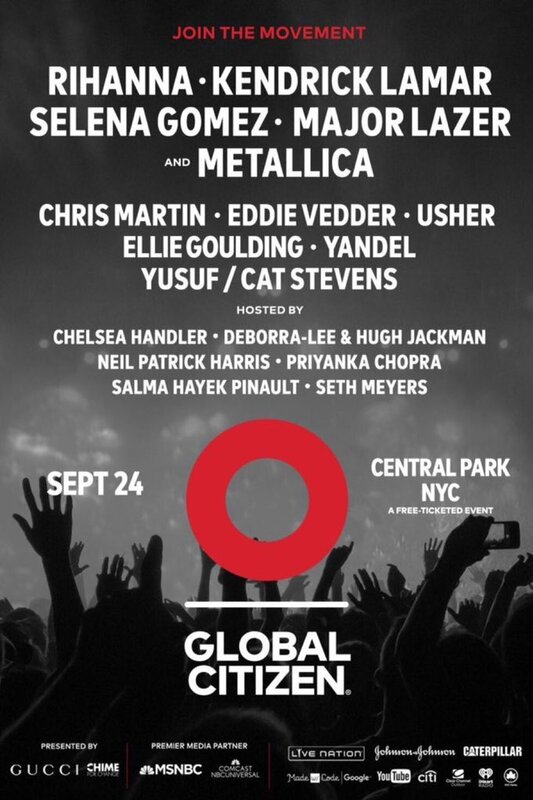 Who would have thought you could see Chelsea Handler, Hugh Jackman, Neil Patrick Harris, Priyanka Chopra, and more on the same stage together? So go do some good and maybe win your way into an incredible concert for an incredible cause! 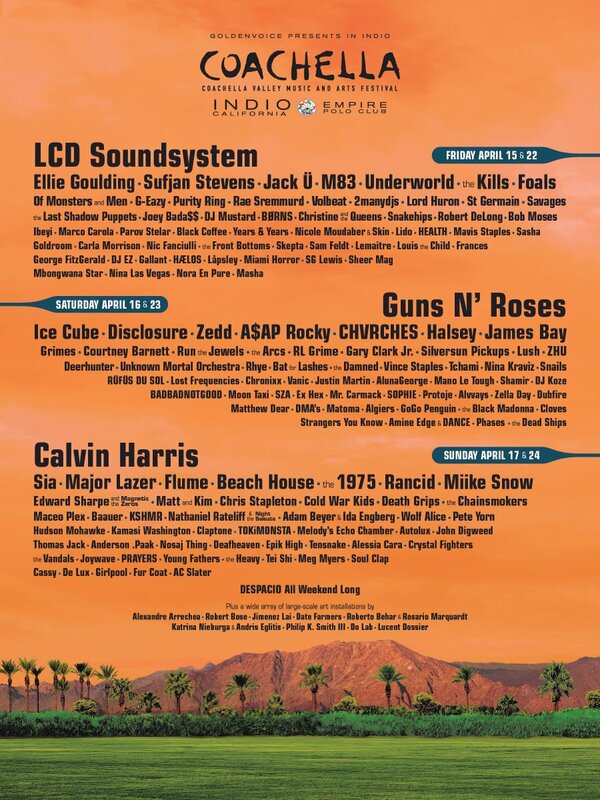 The Coachella 2016 Line Up Has Been Announced! If Coachella was in the dictionary it would go something like this. Coachella- Where celebrities dress like hippies, pop some Molly, and enjoy a festival that us normal people would love to see, but unfortunately can’t afford to go to. This lineup is pretty incredible though, you can’t deny that. Calvin Harris, Sia, Major Lazer, Guns N Roses, Halsey, Ellie Goulding, and G-Eazy, just to name a few! I mean if anyone is reading this and needs a blogger and can pay for me, I am totally available. Like totally, just remember that. Keep that in mind. Totally available. Posted on January 5, 2016 January 5, 2016 Categories Celebrities A-J, Celebrities K-ZTags 2016, asap rocky, Calvin Harris, Coachella, Ellie Goulding, Guns N Roses, Halsey, ice cube, lineup, Major Lazer, Sia, zaddLeave a comment on The Coachella 2016 Line Up Has Been Announced! The 2014 iHeartRadio Music Lineup Has Been Announced! For the past what, two years, this has been the musical line up to be a part of. It is one of the biggest concerts of the year and evveryone wants to go. The only thing is that it is expensive, you need to most likely travel, oh and most of the tickets are on hold for radio contest winners all over the country. So it is kind of impossible to go to! Yeah I said it! This lineup is pretty badass though, I think we can all agree that Friday is the night to be at. I mean Taylor Swift and Usher in one night? I think that my head would explode! Zac Brown Band isn’t bad either, they have some incredible songs, the only person I would skip is Ariana Grande. Let’s be real we all know that Iggy will be making an appearance that night too because she needs to sing “Problem” with Ariana since all she releases is duets rather than her own songs. On Saturday September, 19th all of this craziness will start and I will probably be at home crying wishing I was there! If any of you radio stations want to give me a free ticket, I won’t hate it. Posted on July 23, 2014 Categories Celebrities A-J, Celebrities K-ZTags 2014, Concert, Ed Sheeran, Iggy Azalea, iHeartRadio, Lil Jon, lineup, Lorde, one direction, paramore, taylor swift, train, usherLeave a comment on The 2014 iHeartRadio Music Lineup Has Been Announced!